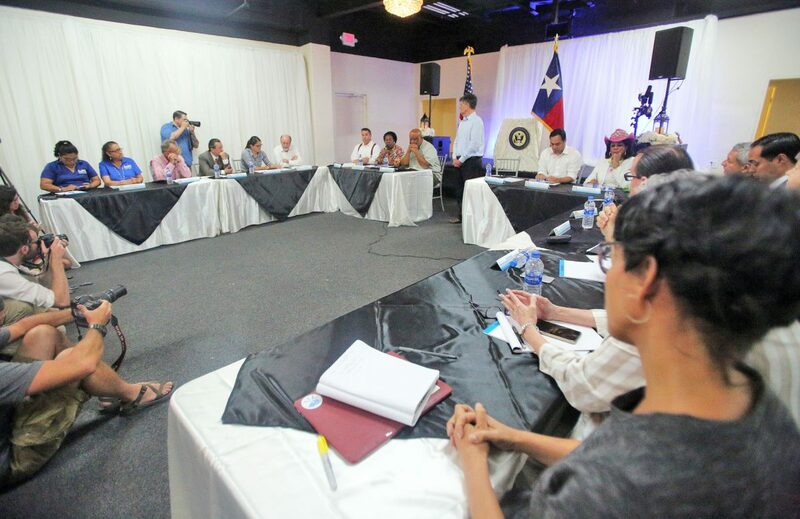 A panel of U.S. members of Congress and local leaders give statements concerning the separation of immigrant children from their families in a roundtable discussion with members of the press at D'Gala Event Center on Monday, June 18, 2018, in Brownsville. BROWNSVILLE — How does love demand us to act? 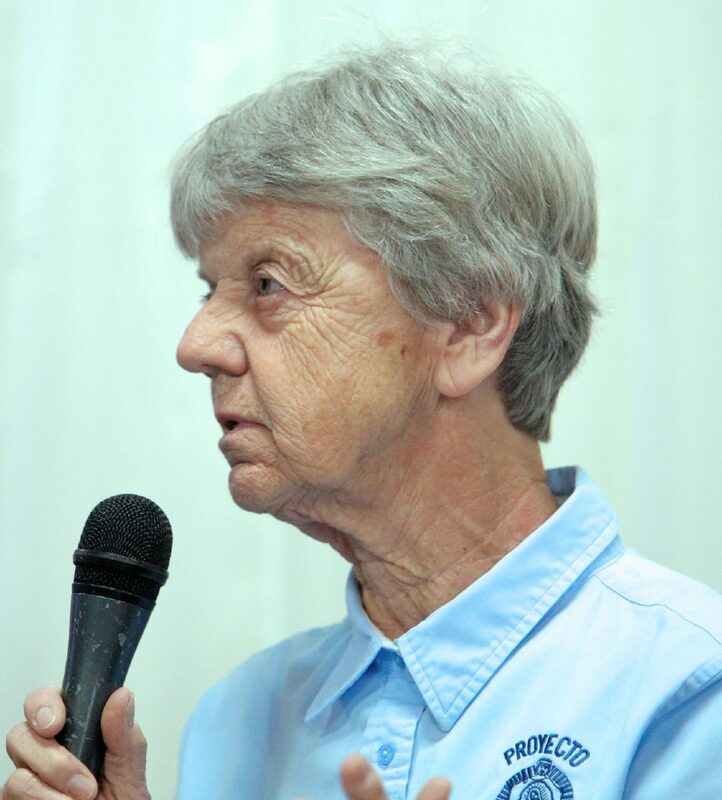 Sister Phyllis Peters of Proyecto Juan Diego, an advocacy group part of the Rio Grande Valley Equal Voice Network, posed that question Monday during a roundtable discussion on the Trump administration’s “zero-tolerance” policy that has led to families being separated at the border. “I believe strongly that this will be on all of our consciousness, not only on President Trump’s,” Peters said. “I believe it is a universal sin unless we get up and really act, and defend what we believe. I’m not sure we’re doing that today, because when we’re abusing children, not only those who are coming into our country, we are also abusing all the others who are witnessing these actions. Sister Phyllis Peters, Proyecto Juan Diego, speaks as part of a panel of U.S. Congress members and local leaders give statements concerning the separation of immigrant children from their families in a roundtable discussion with members of the press at D'Gala Event Center on Monday, June 18, 2018, in Brownsville. A day after media and lawmakers got a look inside the immigration processing center in McAllen, U.S. Rep. Filemon Vela, D-Brownsville, hosted a roundtable Monday with members of Congress and local immigration advocates regarding the family separations crisis along the U.S.-Mexico border. Vela, who stood with protesters outside the Ursula Processing center at Sunday’s Father’s Day vigil and protest, said this is an issue that can be changed with a stroke of a pen. Homeland Security Committee Ranking Member Bennie Thompson, D-MS, joined Vela along with Reps. Sheila Jackson Lee, D-TX; Ben Ray Luján, D-NM; Frederica Wilson, D-FL; and Joaquin Castro, D-TX; Secretary Julian Castro, Housing and Urban Development. Cameron County Judge Eddie Treviño, Monsignor Bert Diaz of St. Mary’s Catholic Church, Michael Seifert with the ACLU, Christina Patiño Houle with RGVEVN and Scott Nicol and Jim Chapman of Sierra Club also attended. Members of Congress arrived for the roundtable after spending much of the morning touring both Casa Padre and Casa Presidente, the Southwest Keys Program facilities where unaccompanied children are being housed. The lawmakers spoke of the facilities and their interaction with some of the children, and the personnel tasked with caring for them. One by one, every person in attendance condemned the continuing practice of removing these kids from their parents. Calling it “immoral and disgraceful,” the lawmakers said President Trump has the power to end this policy immediately. Dr. Dolly Lucio, a Brownsville pediatrician, was also on hand to provide her input on the potential issues related to separation of children from their parents. Lucio considers the policy of separating children from their parents a form of torture for these kids. In a tweet Sunday night, shortly after members of the media toured a immigration processing center in McAllen, Nielsen said the media and others were acting “irresponsibly,” by misreporting the enforcement DHS has carried out. “As I have said many times before, if you are seeking asylum for your family, there is no reason to break the law and illegally cross between ports of entry,” Nielsen tweeted. U.S. Rep. Beto O’Rourke, who was in the Rio Grande Valley last Monday for his own tour of facilities and meeting with asylum seekers, said he had heard the same reports of CBP officers going into the “no man’s zone” between the two countries and heading off asylum seekers. Vela said Monday he has heard the same. But published reports show at least a few recent instances of U.S. Customs and Border Protection officers in El Paso, McAllen and Nogales turning away asylum seekers — claiming lack of capacity. U.S. Rep. Henry Cuellar, D-Laredo, who visited with media in McAllen before noon Monday, appeared to be under the impression asylum seekers could present themselves at the ports of entry without issue. “My message is very simple, if you’re going to ask for asylum of credible fear, go through the port of entry because there you will not violate section 13.25,” Cuellar said. When asked about the incidents of asylum seekers being denied their outcry, Cuellar said he would check with CBP. U.S. Border Patrol Rio Grande Valley Sector Chief Manuel Padilla Jr., who met with members of the media Sunday, said there was no policy of separating families, instead stressing that if there are no consequences for those who enter the country illegally, the result could potentially be larger number of immigrants coming into the country. Padilla, echoing the public statements of U.S. Attorney General Jeff Sessions whose April 6 memo on zero tolerance ignited the current separations along the border, said the implementation of the aforementioned memo is done purposefully to deter future illegal crossers. President Trump on Monday took to social media to blame Democrats for not doing enough to protect the country’s borders. But some critics view the current administration’s policy as a ploy to negotiate funding of a border wall along the U.S.-Mexico border. But the CBS reporter stated that during her tour of the facility she personally heard from parents who said they were not aware of the separation. 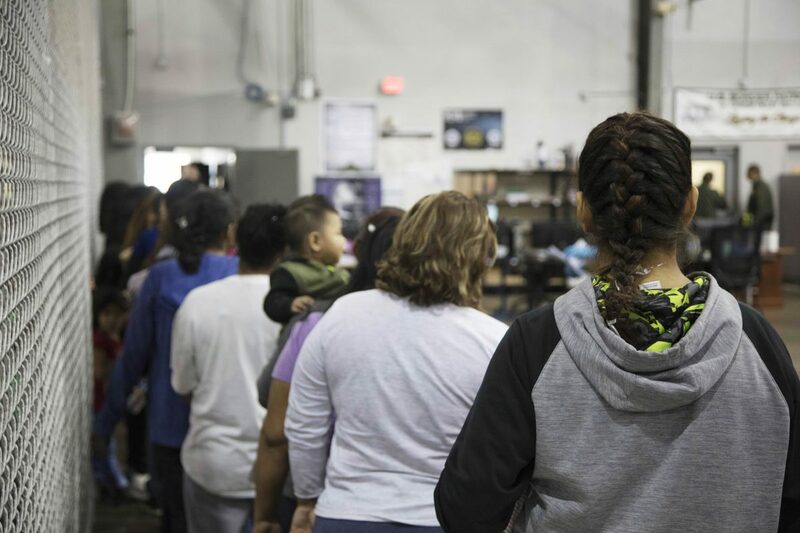 Instead, Border Patrol agents at the processing center said parents are made aware of the separation when it is determined they will be sent for criminal prosecution by way of an informational handout. But the handout does not give information regarding where the child would end up. Also on Monday, U.S. Senator John Cornyn, R-TX, discussed his plan to update and reintroduce his 2014 legislation, the HUMANE Act, to keep parents and children who’ve been apprehended at the border together while they wait for their court hearings. Condemnation from the GOP has not been widely reported, and Cornyn appears to be the only Republican proposing legislation to stop the separation at the border. “We have to keep family members together and prevent unnecessary hardship, stress and outrage,” Cornyn said. “The good news is we have it within our power to find a better way, because parents who are awaiting court proceedings shouldn’t have to do so separated from their children, and children shouldn’t be taken from their parents and left frightened and confused about where they are and what is transpiring around them. On Monday, Sen. Ted Cruz, R-TX, in a reversal from just the day before also called for an immediate end to family separations and announced the introduction of the Protect Kids and Parents Act, according to a news release.